A lot of building joints suffer from environmental influences and climate impact. The stress is especially high on balustrades, ledges and sheet metal flashings. Restoring church towers and monuments liquid lead is often used to cover joints and to seal large gaps. Effusing joints with lead is much more stable and durable than sealing them with cement. 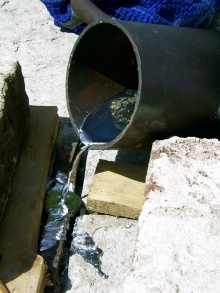 Cast lead is used when pouring anchors and dowels. This historical technique ensures a long-term stability, even at high accelerations. The material lead has a particularly low melting point at 327°C. Lead snippets are easily melt in a trowel over the Bunsen burner. 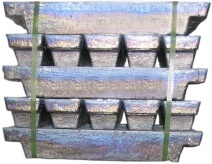 For lead ingots a suitable melting pot is needed. The liquid lead has to be poured carefully, but at the same time quickly into the apertures. Thus, the material is distributed in gaps which are difficult to access. The joints and the adjacent components must be absolutely dry and dust-free. The filling is later caulked in a force-fitting manner and smoothed with the chisel.